Opened the first chapter with description of home pregnancy test. Reduced discussion of mechanical balance. New discussion of atomic weights and their uncertainty based on 2009 IUPAC report on atomic weights. See new Box 3-3 for my handling of atomic weights. F test was moved ahead of t test so F could be used for t.
Amplified discussion of hypothesis testing. New box on Medical Implication of False Positive Results. Chapter was reconstituted and slightly revised from QCA 7e. New Opener – Titration on Mars. Experimental detail added for Volhardt titration. New problem 7-36 asks "What is wrong with this procedure?" Fundamental change: new approach to numerical solution of systematic equilibrium problems with spreadsheets was implemented in Section 8-5. One exercise and 8 new problems were added to illustrate the new approach. New Opener on CO2 in air. Enhanced Box on CO2 in ocean. New Box on microequilibrium constants. Chelation therapy moved to chapter opener from former Box. Advanced equilibrium implements new spreadsheet approach from Chap 8. Circular definition in spreadsheet automatically finds ionic strength and activity coefficients without manual iteration. Revised discussion throughout chapter to note that electrons flow from less positive to more positive potential. Fundamental equations were modified to distinguish n = units of charge and N = moles in the formulas q = nNF and G = nNFE. Added figure emphasizing that potential changes at phase boundaries. New Box 14-2 on H2-O2 fuel cell in Apollo 13 spacecraft and new Box 14-3 on lead-acid battery. There is a new Opener on DNA sequencing, new discussion of ways to reduce the detection limit for ion-selective electrodes and the use of ion-selective electrodes to measure dissolved CO2. Box 15-4 describes an ion-selective electrode with an electrically conductive polymer for an immunoassay. Added environmentally safe alternative for enzymatic pre-reduction of nitrate. Added dissolved O2 analysis with Winkler titration in Problem 16-28. New Figure 17-7 describes measurement of Ohmic potential with a Luggin capillary. Box 17-1 introduces reactions at atomic steps on a crystal surface. The application of a glucose electrode to measure other analytes is described. Voltammetry of double strand DNA and stripping analysis of perchlorate with a conductive polymer electrode in Figure 17-26 are new. Figure 17-32 explains why sigmoidal voltammograms are observed with microelectrodes. Box 17-5 on aptamers is new. Section 18-4 now includes an example of preparing standard iron solution and an example of serial dilution. New problems 18-23, -24, and -25 deal with preparation of standards and serial dilution. Box 18-2 is updated with a discussion of Hg in fluorescent bulbs and Hg emission from burning coal. Box 18-4 describes designing a molecule for fluorescence detection. Figure 19-1 (b) was simplified for clarity. Figure 19-5 provides data for analysis of a mixture with Excel Solver in Problem 19-8. Figure 19-7 provides data for curve fitting to find an equilibrium constant with Solver in Figure 19-8. Exercise 19-C deals with finding and equilibrium constant with Solver. A new immunoassay for Hg was added to Section 19-5. Box 19-1 is updated for a dye-sensitized photocell and a solid-state perovskite photocell. Box 20-1 is updated with solar radiation and global temperature data from 2013. Section 20-3 describes an image intensifier in Figure 20-18 and mentions photoacoustic detection described in Box 20-3. Section 20-6 has new Figure 20-35 showing the limits of signal averaging and a new section on Savitzky-Golay polynomial smoothing. Problem 20-38 applies polynomial smoothing. Box 21-2 uses Bunsen burner photometer to illustrate atomic emission. Laser ablation was separated into a separate section with atomic emission on Mars as an application. For inductively coupled plasma, dynamic reaction cell replaced collision cell. Added new section on X-ray fluorescence including spectral interpretation. Amplified discussion of halogen isotopic peaks. 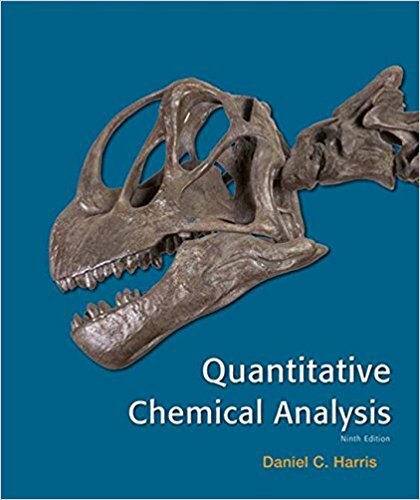 Back cover of book and Chap 22 relate dinosaur body temperature to isotope ratio measurements. Expanded discussion of time-of-flight spectrometer and added examples of orbitrap capability for mass accuracy. Added direct electron ionization and photoionizaiton liquid chromatography‒mass spectrometry interfaces. Updated application of selected reaction monitoring. Added field-portable spectrometry. Enhanced ion mobility section with addition of field asymmetric waveform spectrometry and traveling wave ion mobility state inside a mass spectrometer. Contributor Chuck Lucy made principal revisions. New opener on chromatography of components of milk. New color plate illustrates mechanism of chromatography by partition of solute between immiscible phases. Updated section on efficiency of separation. Added illustration on effects of N, α, and k on plate height. Added band broadening in connective tubing. Improved illustrations of mechanisms of band broadening with more emphasis on mass transfer. Distinguished effects of overloading in gas and liquid chromatography. Added 6 problems with emphasis on conceptual understanding. New opener on doping in sports. More emphasis on column selectivity and factors affecting retention by columns. New examples in chiral separation and chromatography on a chip. Added headspace extraction, olfactometric detection, and vacuum ultraviolet detection. Added 9 new problems including qualitative questions and two literature search problems. Enhanced discussion of types of polarity for liquid chromatography, van Deemter terms for fused-core particles, HILIC, sample injection, method development for reversed-phase chromatography, selecting pH for separations, gradient separations. New table compares HPLC and UHPLC. New table of solvent properties includes types of polarity. Box 25-1 introduces slip flow chromatography. Box 25-3 shows solvent gradient in supercritical fluid chromatography. DNA profiling opener and DNA profiling lab on a chip Section 26-8 are new. Ion exchange equivalents introduced. Donnan exclusion reduced to qualitative discussion. Speciation introduced in ion chromatography. Mixed mode retention in ion-pair chromatography introduced. Improved graphic of size exclusion separations. Electrophoresis has more emphasis on effect of size on ion mobility and effect of pH on mobility of weak acids. New discussion of nucleation from recent literature was added. New Figure 27-2 shows onset of crystallization from amorphous particle. New Figure 27-4 shows effect of electrolyte concentration on particle repulsion. Added color plate on solid-phase extraction.